I have always been fascinated by technological progress ! I see similarities between the advances in technology and Darwin's theories. Darwin believed that only the fittest survive and you have to change to fit your environment. Mainly changes happen very slowly...but...a World-changing event can result in a massive leap in evolutionary terms in a very short period! I see computers and the Internet as a World-changing event! Computers have made a huge difference in such a short period, what could be just around the evolutionary corner? Hollywood has always demonised Robotics. However, I believe the future could be different, combining the human body with computers with the birth of the new dominant species of Robo Sapiens! This has already started with medical pace makers and robotic prosthetic limbs. I believe Robo Sapiens is our next evolutionary step, as Homo Sapiens combine with computerisation. The human body has already been outdated. Robotics can out perform nearly every human action. To me, the obvious evolutionary flaws in the human body can be solved by combining human with robotics. Like computers, the human body could have simple plug-in upgrades. At present computers still cannot compete with the human mind. I believe the human consciousness or 'mind' can never be replicated digitally by a series of 1 & 0's. Human consciousness is more likely to be non-algorithmic in nature. However, Quantum computers could unlock Artificial Intelligence (A.I), in the next few years! The material I use is Electrical Communication Wire. Used by telecommunication companies for Internet connections throughout the world. Computer parts also play an important supporting role...! I picked 'The Thinker' by Rodin because I was trying to combine my ideas of Robotics and Artificial Intelligence and how computers are becoming humanised (self-aware). I instantly thought of `The Thinker' This sculpture encapsulated what I was trying to say, because it is an iconic figure, which nearly everyone associates with thinking. 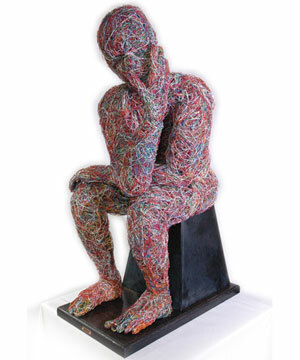 My 'Electric Thinker' and my quarter sized version called '1.4 Thinker' are my updated versions of Rodin's sculpture. 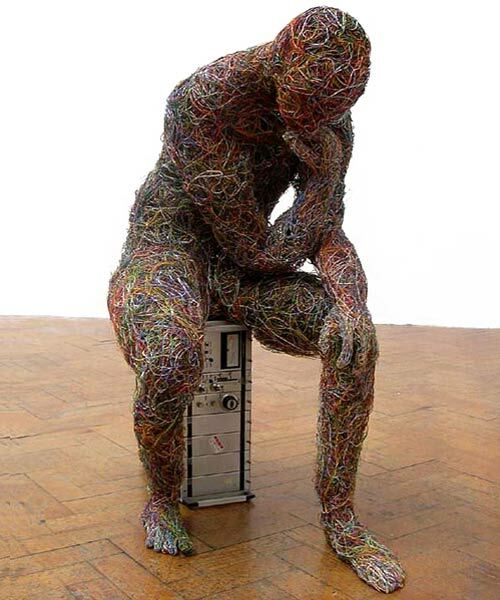 The Thinker deals with the idea of how the Quantum computer may one day think in a similar way to the human brain. As man and machine become more intertwined and dependent on one another. The melding of man and machine! Evolution means procreation, hence 'The Kiss' by Rodin also became important. At the moment, the urge to procreate is a uniquely organic function. When man merges with machine, what will happen to procreation? It is the joining of two minds and the electrical spark between them as they merge together. It is the electricity, the suspense, the anticipation! The moment before your first kiss ! As the wire is forced and bound together, this captures the moment and the movement in time, which is a powerful force. The wire seems to buzz with electricity. As a species, we are relying more and more on computers, not only in work but also for pleasure. Based in the Capital of the High Peak, Derbyshire. United Kingdom. '1.4 (One Point Four) Thinker' is approx Quarter life size. 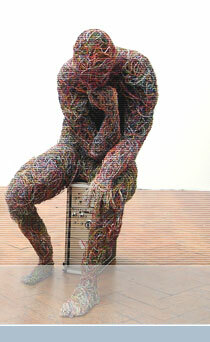 3D Sculpture made from mixed media including Telephony/Internet Wire.